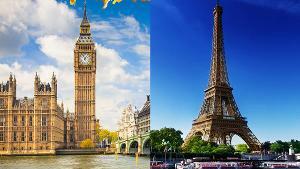 Prize: 3 nights hotel each in London & Paris in centrally located neighborhoods; Transportation between London & Paris on the High-speed Eurostar train; half-day of guided sightseeing in each city; VIP access to must-see landmarks (no int'l airfare) ($8,000). Statistics: This contest was opened by 107 and entered by 12 ContestChest.com members. 11% of those who opened the contest, entered it.